A partnership of government and private industry is starting down the road to launch a bike share system in the Seattle area. 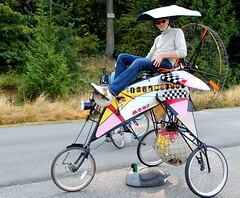 Over the years I’ve reported on quite a few charity bike rides at this blog, as well as published an exhaustive list of charity bike rides from across the US. Now it’s time for me to step up and raise pledges for a charity bike ride I’m supporting. This September I’ll be riding in the Camp Challenge, a charity bike ride to raise funds and awareness for Camp Korey, which serves children with life-altering medical conditions. I know about the camp out in the Snoqualmie Valley because my daughter has been attending one-week summer camps there for the past three years. Paige (that’s her in the blue T-shirt in the upper right photo) has great fun …. 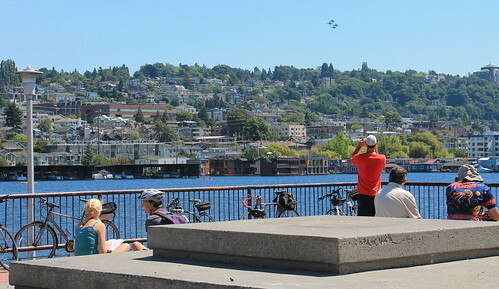 Although the main stage of the Blue Angels performance at SeaFair in Seattle this weekend is Lake Washington, this group of cyclists knew they could see Friday’s practice runs from Gas Works Park overlooking Lake Union.